Labor Day weekend has finally arrived. The schools buses started to show up on the streets this past week adding to the local traffic, and making us daydream of the nice easy summer commutes to work we enjoyed just a short time ago. Our daughter Hanna isn’t in school yet, but it felt like the last summer weekend anyways so we decided to take another trip. This time all the way down to the southern most point of Jersey known as Cape May. 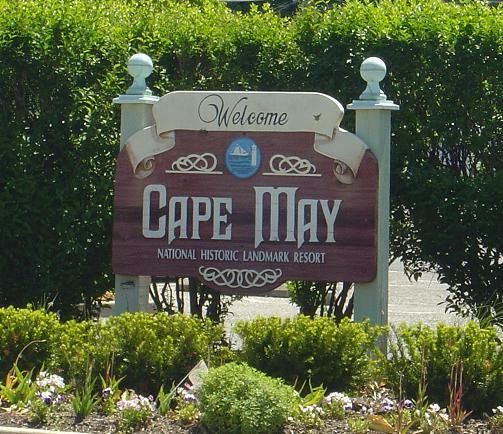 Cape May is really a beautiful place, with a lot of things to do. My wife an I stayed here a few years ago for a long weekend and it was really relaxing. Being so far south there isn’t a lot of traffic from the New York crowds, so this is really a Jersey beach with some people cover over from Delaware on the Ferry (but we’ll go over this a little later). 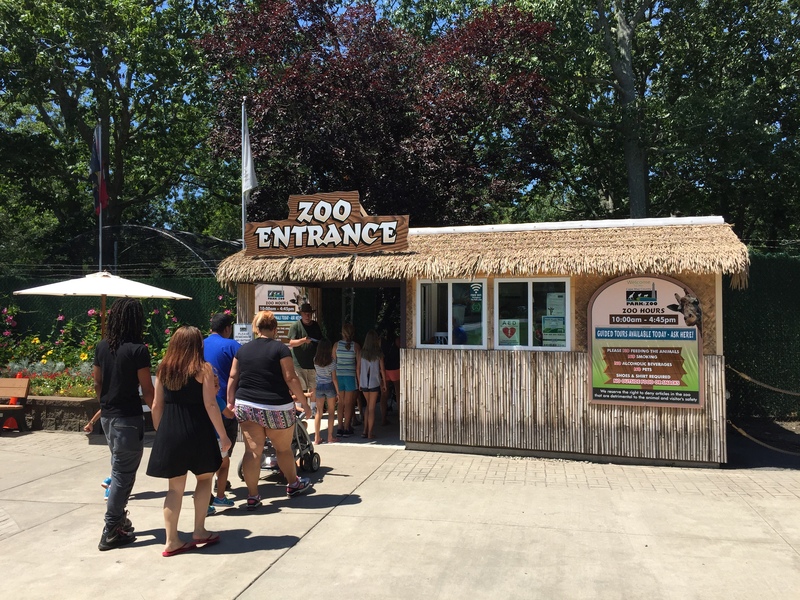 Our first stop was the Cape May County Park & Zoo which is actually located about 15 minutes outside of Cape May. Admission is free, but they do accept donations which I would highly recommend. Even though the zoo is free this is a really nice place. There are lots of different animals from all over the world. The employee’s that work here are all very knowledgable and very friendly. 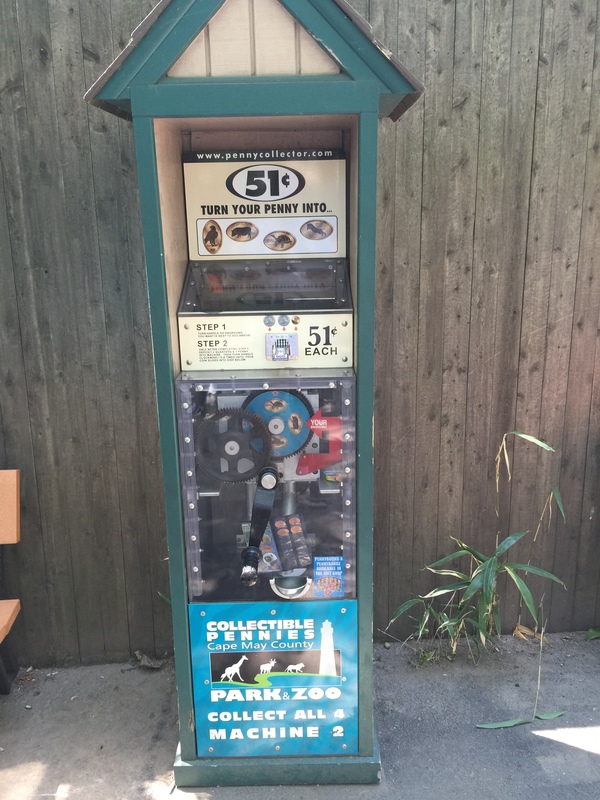 As soon as we entered the zoo I found our first penny machine. 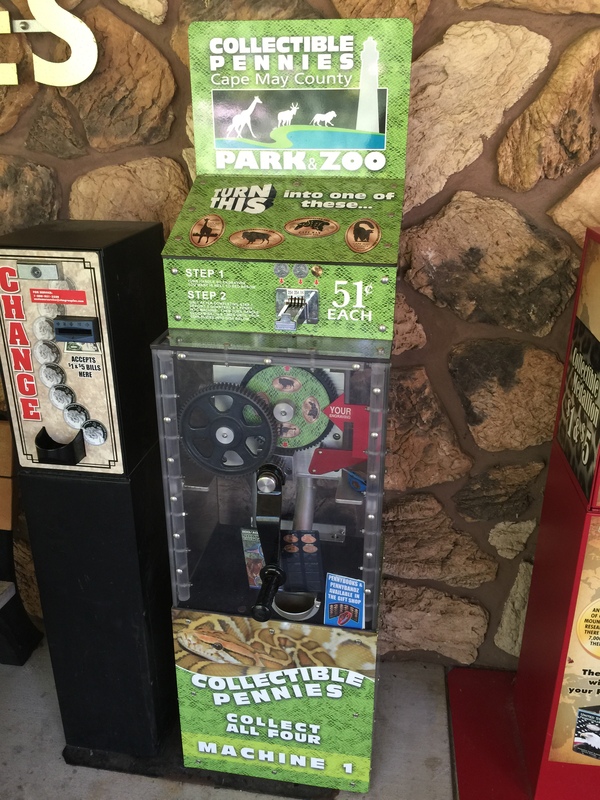 The cabinet for the machine was in great condition and I’m sure helps with all the difference weather through the seasons as the zoo is open year round. You may notice as I did that the sign at the bottom listed this a Machine 2, so I knew I had to keep my eyes open for at least one other machine. 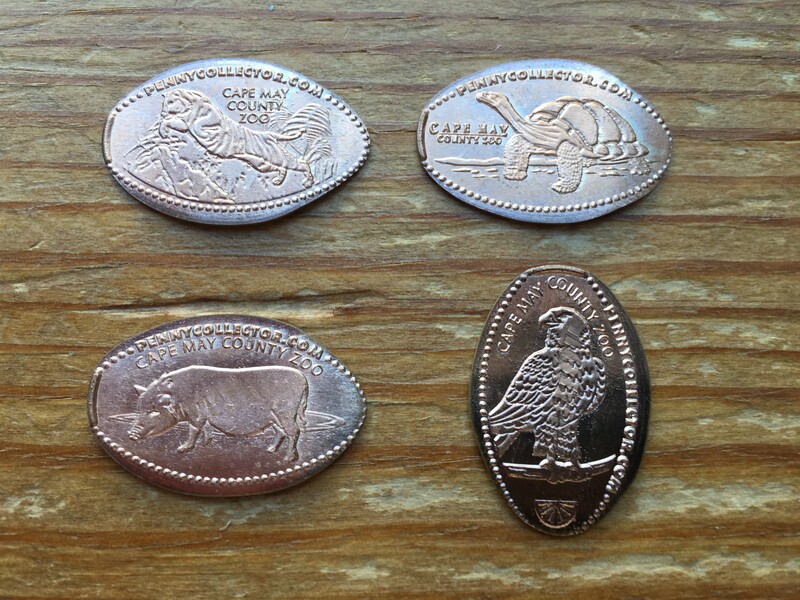 Just like every zoo I have visited and collected pressed coins for these designs were of animals they had on display. These included: A Leaping Tiger, Large Tortoise, A Pig, and an American Eagle. With coins in hand we continued to check out the zoo, petting some farm animals, watching some of the more exotic ones getting fed, and they also had nice play structure for the kids to climb and play on. Eventually we made it over to the Reptile House which I will say is not one of my favorites but at the same time can’t resist getting up close and personal with them. Right outside the Reptile House was the second (or technically first) machine. I always come prepared, but there was a change machine located here as well in case you’re in need. 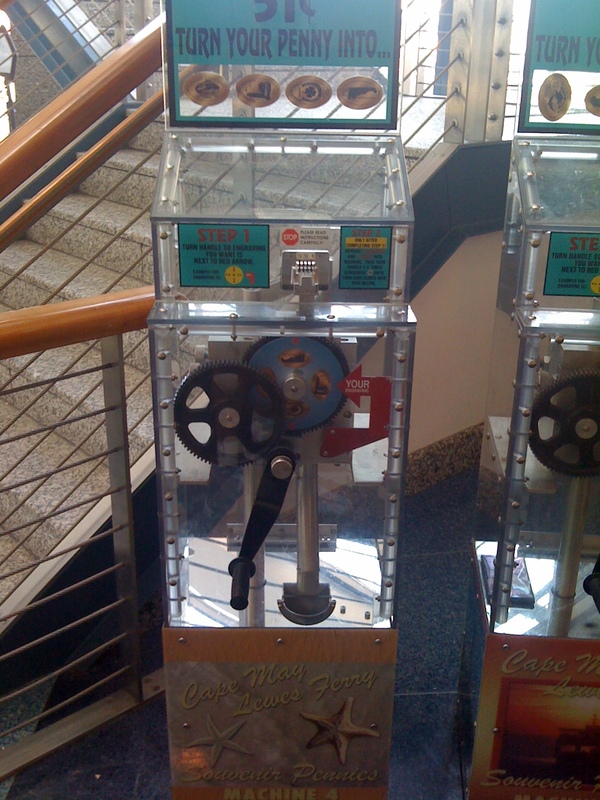 My experience is that these change machines are usually out-of-order more often that the penny machines. My advise is always bring enough change for the machines you had planned to used, and then also bring a few extra sets of coins just in case of emergency. You never know when the machine may have a bad roll, or you come across another machine you didn’t know was there. 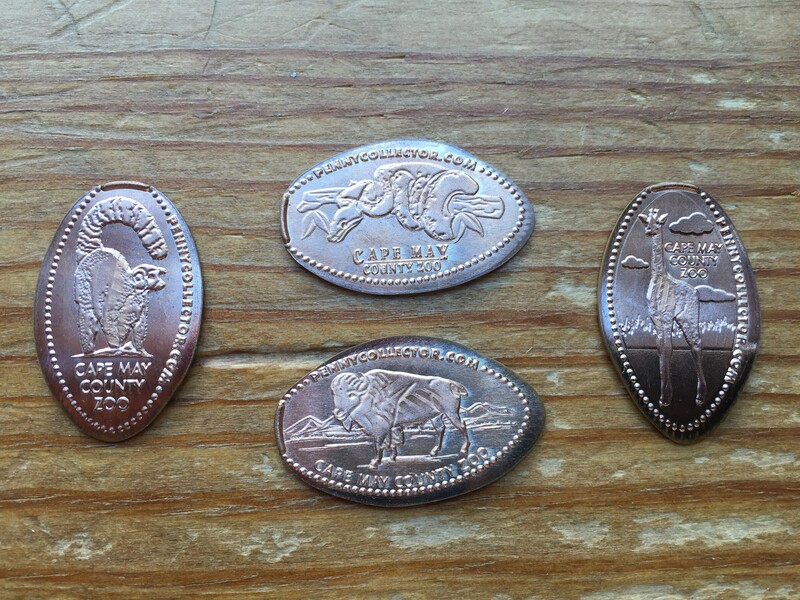 These coins pressed without any issue. The four designs are: A Ring-tailed Lemur, A Boa Constrictor, and American Bison, and a Giraffe. On the subject of the Giraffe there is part of this zoo where you walk along a wooden platform through the woods that seems to go on forever, but trust me it’s work the walk. 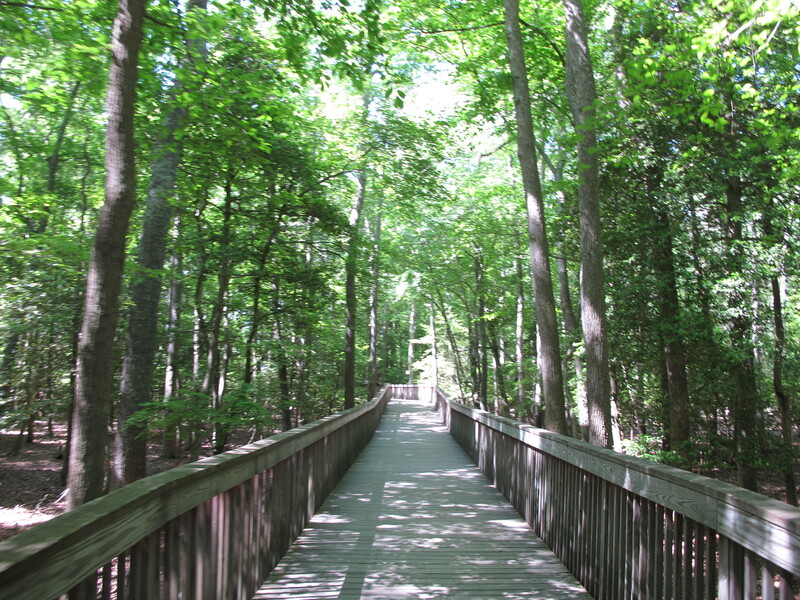 Above is an actual picture of the walkway. You eventually come out to one of the most amazing exhibits I’ve ever seen to view Giraffes, Zebra and some other African animals. You are on a raised platform that is maybe 6-7 feet in the air and it gives you a really nice vantage point to view the animals up close. After the African exhibit we made our way back through the zoo towards the exit. We jumped in our car and headed into Cape May. It’s filled with beautifully restored Victorian houses, and there is a lot of history here. On a previous trip my wife and I took a horse and buggy ride around town and the driver was a wealth of historical information that was really amazing. 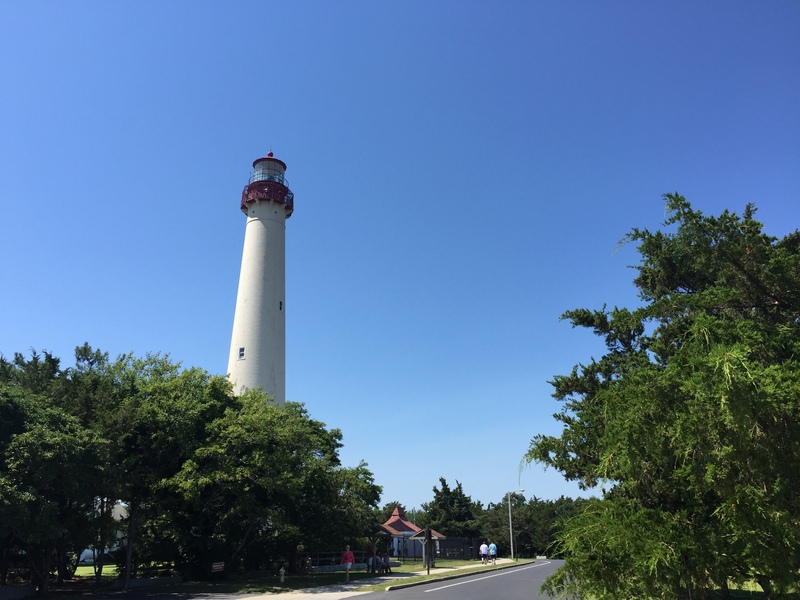 As we drove around we eventually came to our next stop the Cape May Lighthouse. The Lighthouse was built in 1859 and is 157 feet 6 inches tall. It has 217 steps which for a small fee will take you up to the very top. We didn’t make the trip up to the top, but have before. It’s quite a work out and not for anyone that is afraid of heights. As with every lighthouse the view from the top is gorgeous and will take your breath away. This visit though was just to use the brand new 4 design penny machine that had just been put on display. There used to be a one-die version that was here for years, but that has since been replaced with this beauty. 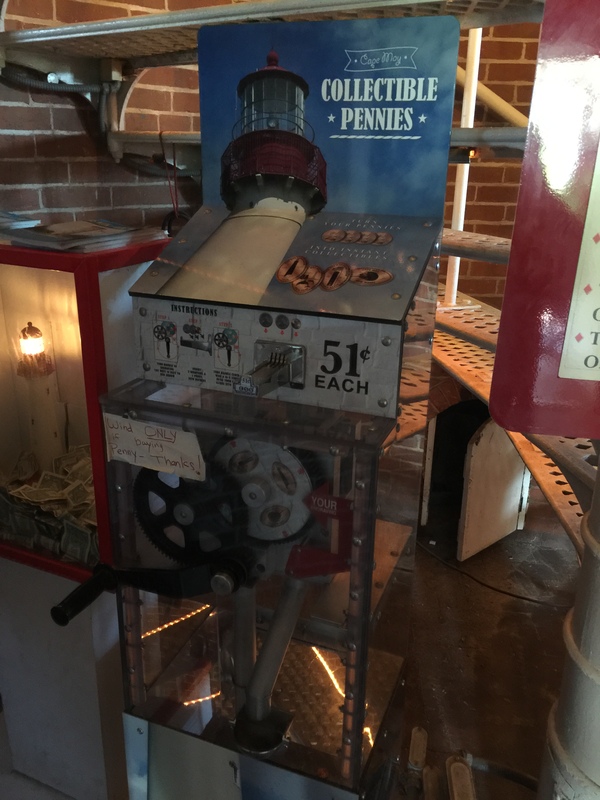 No admission is required to use the penny machine. It’s located at the bottom of the stairs across from the information desk. 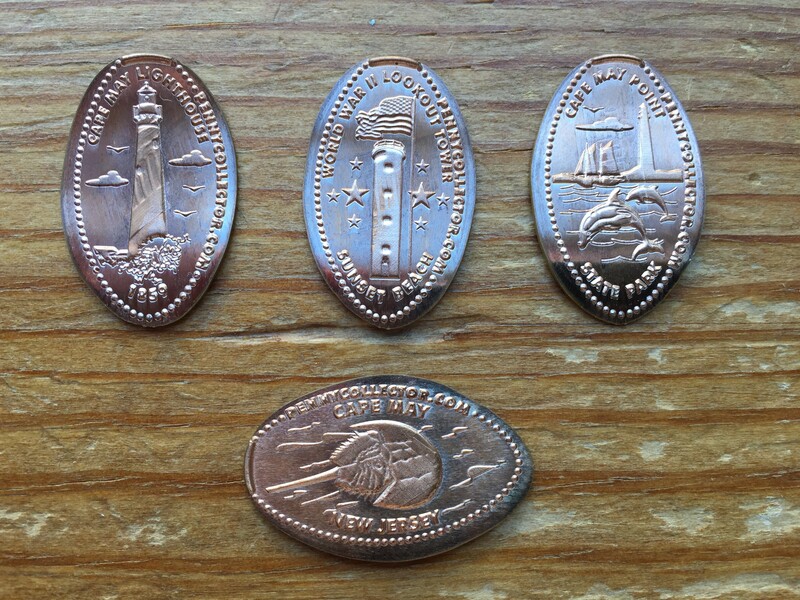 The 4 designs are all Cape May inspired: Cape May Lighthouse 1859, Cape May Point State Park, World War II Lookout tower Sunset Beach, and a Horseshoe Crab. Have you ever seen a Horseshoe Crab? They are weird but really amazing little creatures. Adventure Aquarium in Camden, NJ has some on display that you can touch, and the handlers will also flip them over so you can see what they look like under their armor. 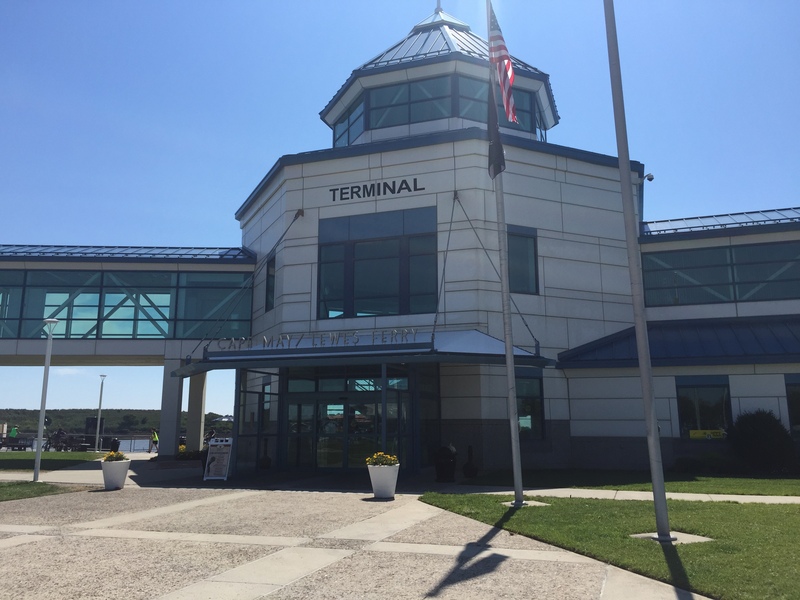 Back in the car for another short trip over to the Cape May – Lewes Ferry Terminal. This is pretty self-explanatory there are ferry’s that will take you from Cape May New Jersey across to Lewes Delaware and vise versa. On our trip last year to Washington DC we took the Ferry back to Jersey from Delaware. It was about an hour or so trip, and you just drive you car right onboard and then walk up to the passenger areas where you can stand out on desk with the sea breeze in your face, or you can enjoy a snack at the concession stand and sit inside. There is no cost to park here, however when you are entering if you are only visiting to use the penny machines make sure you use the lanes for dropping off passengers. Otherwise you may get stuck in the lanes to board the Ferry. 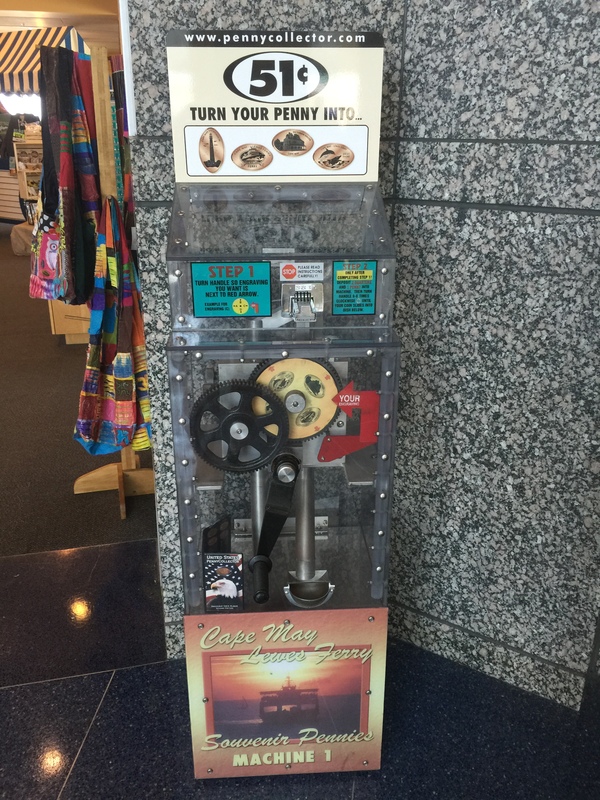 As soon as you walk inside there is a gift shop to the right and the last penny machine of the day was located just outside. 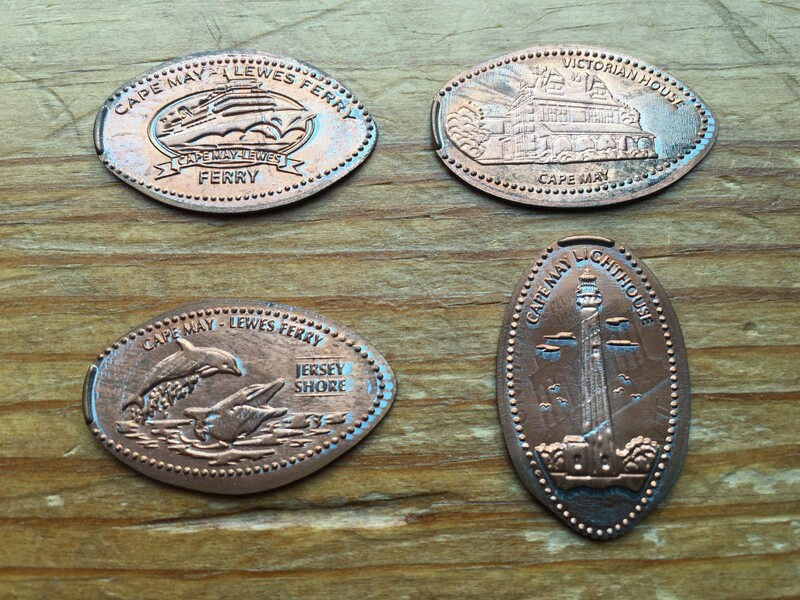 I pressed the four designs which were of: The Cape May Lighthouse, Cape May-Lewes Ferry, A Victorian House, and Dolphins at the Jersey Shore. As my family took a much needed bathroom break I roamed around the terminal looking for a second machine. On my previous visit there were two machines located here but I couldn’t find it. After coming back home I did some research online and it appears that from time to time the machines will board one of the ferries. Now I can’t say for sure this is where it is, but I’ll keep my fingers crossed that it’s true. As a flash back I posted a picture of the second machine below. Just as a reminder the above picture was taken about 3 years ago. At that time the machine worked great and pressed the 4 designs without any issue. 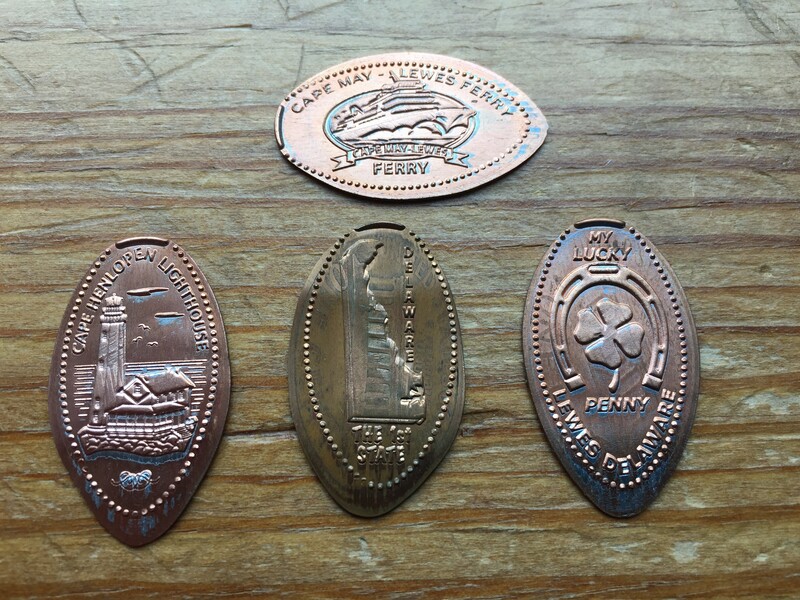 The 4 designs I pressed at that time were: Cape May – Lewes Ferry, Cape Henlopen Lighthouse, Delaware The 1st State, and My Lucky Penny Lewes Delaware. We grabbed from snacks and drinks for our 2 hours drive back home. It had been a nice day to spend outside with the family. We avoided the beach as they are always crazy over Labor Day weekend. It’s sad to know the summer has come to and end. As a penny collector this is always the time of year when the most collecting can get done. During the winter months I try to visit some indoor attractions to get pennies, but most of the time I’m scouring eBay for coins to fill in the gaps of my collection. The weather is still warm, and the sun is shining bright so maybe we will still be able to fit some other coin pressing trips in before the dreaded snow arrives.